The class search layout presented inside the Web Registration Form has less customization capability than the Class Listings Tables, therefore, we always recommend you use Class Listings Tables to display your class information directly on your web pages. If you choose not to use the listings tables, OR, if your customer is enrolling in multiple classes during their initial registration, they will need to use the 'ENROLL IN CLASSES' section within the Web Reg Form to add additional classes. If you allow enrollment during registration, the form will have a "SELECT CLASSES" button to view and select classes. If the class was chosen from the Class Listing table, it will follow the customer into the Reg form and be pre-filled into Class #1 position. There is not a way to remove the Category 1 headers or re-arrange their order. 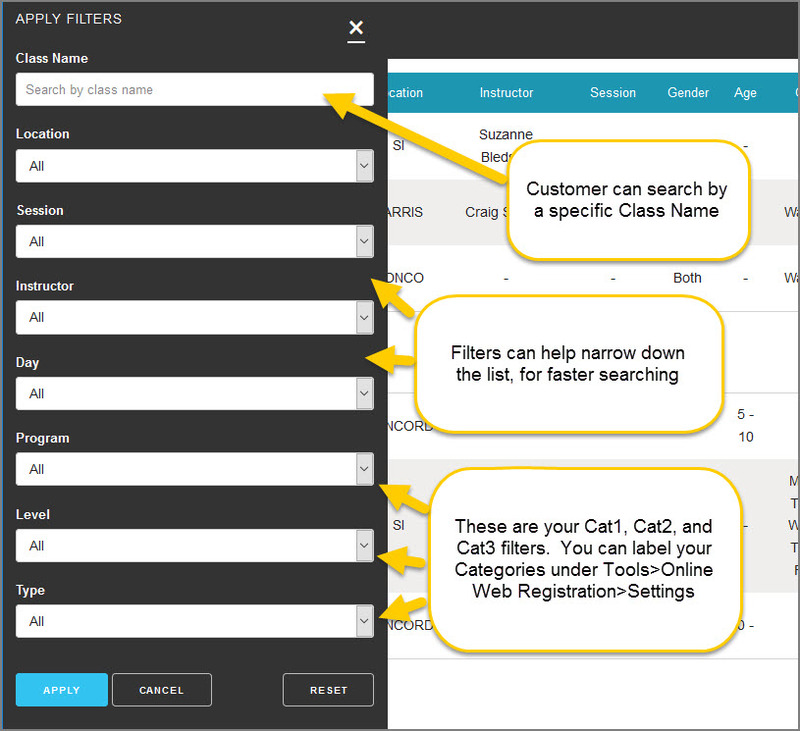 By clicking the Magnifying Glass icon in the upper left corner, the customer can use a Search on the Class Name, and they can also narrow down the list of classes shown using any of the Filters given. The filters are Class Name, Location (only if you are a multi-location database), Session, Instructor, Day, Cat1, Cat2, Cat3. The Categories (Cats) can be re-labeled via that section on your Settings page. We recommend you re-label your Cats to a meaningful name based on what you are using each of them to designate. In this example, Cat1 is labeled Program, Cat2 is Level, and Cat3 is Type. Your Cats may be different of course. For filter dropdowns to function correctly, all classes must have a Cat1 assigned. Perhaps you have some Cats that are not applicable to online class registration, such as "Costume Fee". To prevent a specific Category name from appearing in the drop-down list, go to Tools > Edit Settings>Drop-down Lists > Cat1 (or 2 or 3), and mark it as "Private". Those marked Private will not appear in the dropdown list in the filters. 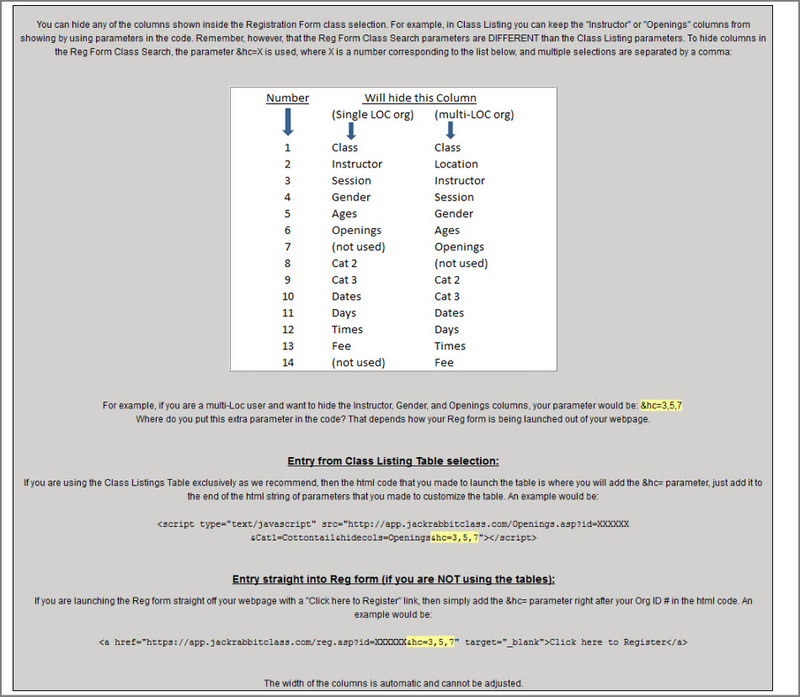 Classes are shown grouped (sorted going down the page) first by Category 1 code names in ABC order, then within each Cat1 by Class name in ABC order. The description text will appear underneath the Class name. This is hard coded and can not be changed or altered. To allow students to get on the Wait List for classes that are full, enable "Allow Waitlist when Class Full" on the Settings page. This will allow full classes to display in the list of available classes, and they will have the word "Waitlist" in the Openings column. If a student uses the online Waitlist link, it will simply place him or her on the Wait List in your database. Waitlisters are never automatically enrolled. Your Dashboard has alerts to let your staff know when an opening becomes available in a class that has at least one student on the Wait List. Then your staff will enroll the top waitlister into the opening. You can hide any of the columns shown inside the Web Registration Form class search by altering the html link code. The code changes are different however, depending on whether you are a single LOC or multi-LOC org, and whether you launch the web reg form directly or via the class listings tables. (Note: if you hide the Instructor, Cat2, or Cat3 columns, it will also remove the corresponding filter). The width of the columns is automatic and cannot be adjusted. If you do NOT want to allow your new customers to enroll themselves into specific classes, make sure you have the "Class Enrollment" set to HIDDEN on your Web Reg Settings page. However, if you do want to allow new customers to choose and enroll into classes, set "Class Enrollment" to either OPTIONAL or REQUIRED, and you also need to ensure those classes meet the criteria for being available for online enrollment. Each class should have the following completed, at a minimum, on the CLASS Summary page in your database, in order to be shown on the above search page.